Oficina Intergubernamental para la Informatica. 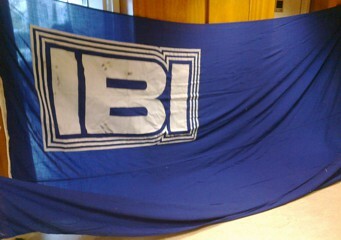 The flag is black with in a very big canton the letters IBI close to each other in black with a white-black-white-black- white fimbriation. Proportions: about 5:8. I just saw by chance that you have an incorrect description of the flag of the Intergovernmental Bureau of Informatics. It is not black and white, but dark blue and white. I had it in my hands last week and attach a photo.